Dr Naomal Balasuriya addressing the audience and Commercial Bank’s Head of Digital Banking Unit Pradeep Banduwansa with a group of exchange house staff that participated in the programme in Dubai. 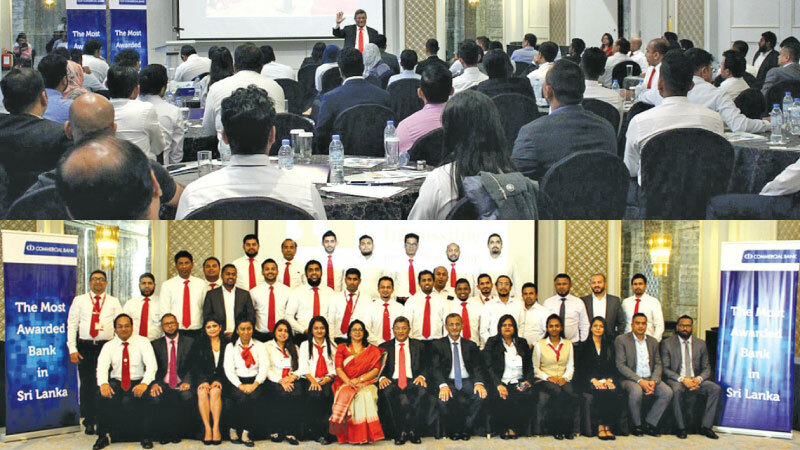 The Commercial Bank of Ceylon recently hosted a two-day personal development programme for Sri Lankan counter staff at exchange houses in the United Arab Emirates (UAE) in appreciation of the role they play in facilitating worker remittances to the country. The programme at the Radisson Blu hotel in Dubai titled “Nothing is Impossible; impossible is nothing” was attended by 130 participants. It was conducted by Dr Naomal Balasuriya, a medical doctor turned life-changing motivational speaker. The Bank said its intention was to offer its partners and their staff something unique which no other bank has done to date, to provide advice and guidance that would be remembered and practiced in their day to day lives and help enrich their lives. More than 200,000 Sri Lankan expatriates are employed in the UAE which is one of the key markets for worker remittances to the country.